During British Raj in 1927 skiing was introduced in Gulmarg and now it is considered as the ski paradise of India. Just 50 kms from Srinagar, altitude 2730 meters. Gulmarg is worth seeing during the whole year. April to November Gulmarg’s large meadows & slopes are full of wild flowers. From November Gulmarg changes its scenery to one of the most beautiful falls in the world and then from December it’s full of snow and becomes one of the major attractions for adventure loving tourists. Powder hounds and freeriders from all over the world come to Ski India, to experience the thrill and adventure of skiing in Kashmir the vast snowfields of Gulmarg Ski Resort. Gulmarg enjoys the position of being one of the highest lift-served ski resorts in the world. This is due to setting-up of a Gandola Cable Car Lift from Gulmarg to kongdori and then to Apharwat top giving a downhill ski run of over 7 kms. Besides, three ski lifts and one chair lift also serves the resort, which are ideal for beginners and intermediate-level skiing, respectively.The Gulmarg itself sits in gently undulating meadows high above the Kashmiri plateau at about 2,730m. Some of the best slopes in the country for beginners and intermediate skiers are available at Gulmarg. Skiing equipment is available on hire fromthe Ski-Shop. In winter Gulmarg natural slopes and inclines turn into the country premier skiing resort. Not all tourists who visit in winter come for skiing - some simply are there to watch the skiing or to enjoy a holiday in the snow. Many of these are infected with the excitement of the skiers, and have donned their first pair of skis within a short while of their arrival. Among the multitudes of slopes, there are a few which are serviced by ski lifts. Most of the skiing becomes centred on these slopes, which are specially suited to beginners and intermediate level skiers, with ski runs ranging from 200m to 3kms, instructors are available for both levels. As in the summer, when each individual sets his own pace for a holiday, so also in winter, skiing can be as adventurous as the holidaymaker can want.There are a number of slopes, not serviced by ski lifts, of varying lengths and gradients. Each of these is quieter than the immensely popular ones with skilifts. Advanced skiers often trek in the snow for several hours to the very top of Apharwat peak, to make adescent lasting no more than 30 minutes. And now, with the operation of the Gulmarg Gondola Cable Car, it has become all the more convenient for skiing enthusiasts, as they can gain a ski run of nearly 3 kms with the help of this cable car which goes up to Kongdori. Due to a heavy rush of people in the Gondola and ticketing problem, Heli-skiing is available for a hassle free skiing. Heli-skiing is the ultimate skiing adventure. The exciting skiing in quality slopes at high altitude coupled with a splendid natural beauty and perfect views from a helicopter is fantastic. Heli skiing opens up vast areas of untouched powder in the world's most famous mountain range. Punch Peak is one of the highest peaks in the Pir Panjals, towering at 4,745 meters / 15,567 feet…offering free riders a descent of more than 2,000 meters / 6,561 feet of thigh-burning vertical drop. With the launching of Heli ski, Kashmir has seen a steep rise in the number of skiers visiting. The helicopter ride is spectacular. You can take photographs and after that the glide down the mountains on virgin snow without having to compete with any hordes is divine. Various skilled adventure sports guides are available, who have climbed Mount Everest more than once. Registration is quick and easy and the rates are cheap starting at US $270. So, if you are looking for Heli ski, Kashmir is the place to look out for and then for sure, you will forget Switzerland. 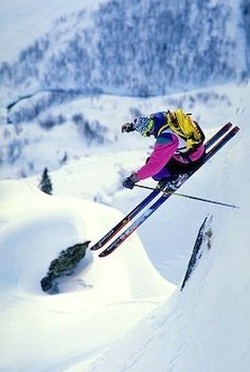 We can offer you some Special packages for skiing. Click here to see the packages offered. Besides the above itineraries we can also make special tailor made itineraries as desired by you.